The Chinese government is committing close to $10 million towards a project which will oversee the refurbishment of the Cook Islands Ministry of Justice, the police headquarters and the sports arena buildings. 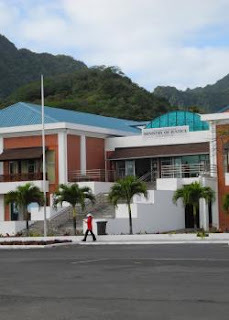 All three buildings, which are owned and managed by the Cook Islands Investment Corporation (CIIC), were constructed by the Chinese through the Overseas Development Assistance they provided the country. Over the years, the buildings have deteriorated and are in need of repairs. Finance minister Mark Brown said the project, which would take almost two years to finish, will start “in the next couple of months”. “There is a big programme of not so much (just) repairs, but total refurbishment of these buildings starting in the next couple of months. This will be paid by the Chinese to the tune of $9-$10 million,” Brown said. Brown confirmed there would be some relocations involved during the refurbishing project. “Whole buildings will have to be vacated so that total refurbishment can take place. The government will be relocating the Ministry of Justice to a temporary headquarters and similar relocation will be done with the police. Earlier CI News revealed the Bluesky Sports Arena in Nikao was among sites being considered to house the Cook Islands Police Service when their building undergoes renovation. CIIC did not supply official comment on the renovation plans and/or alternative sites to house Justice Ministry and Cook Islands Police Service staff during the renovation works, but CINews understands a number of options are being considered. The country’s only indoor sports stadium was one alternative being considered as a temporary site for the island’s police headquarters when the refurbishment talks began last year. The arena is believed to be the first building that will undergo renovation work and the job is scheduled to be completed within five months. The police headquarters is expected to take up to a further 10 months and is expected to be ready for occupancy after mid-2019. The sports arena is believed to be the only viable option for temporarily housing police service staff. Closure of the sports arena would affect a number of sporting codes which use the facility to host domestic and international competitions. Cook Islands Sports and National Olympic Committee (CISNOC) general secretary Robert Graham said that while the closure was an inconvenience, it was necessary in the long run. Sports seasons would continue as usual, he said.